I’ve been a huge fan of Blue Sea marine grade products for quite some time as I have a bunch of their products strung out all over my Vanagon. 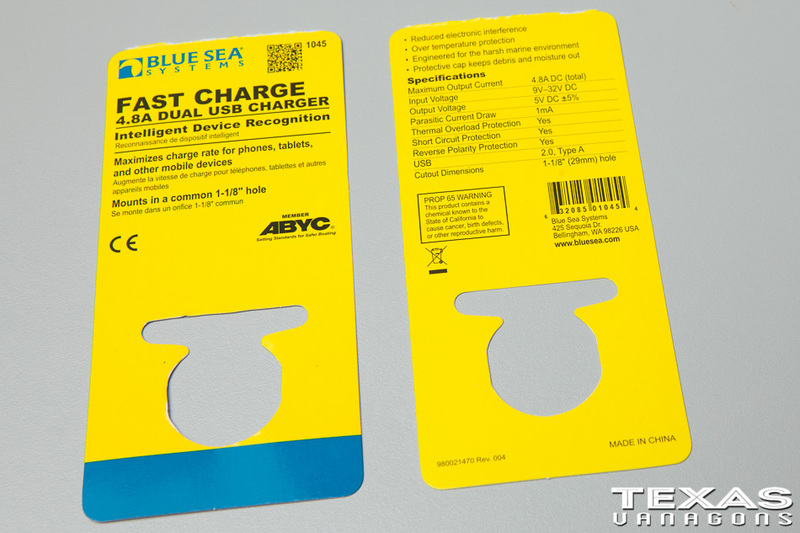 I was a bit surprised when I came across a new product of theirs, its the Blue Sea 1045 USB Quick Charger. I decided to pick one up and give it a try. 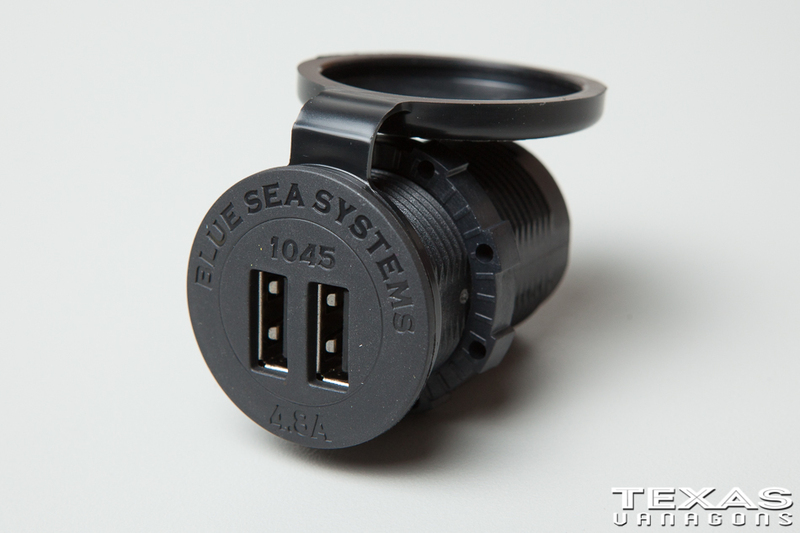 I currently have about 6 of the older Blue Sea 1016 2.1A Dual USB Charger Sockets installed in various locations in my van and one of the things that attracted me to the new Blue Sea 1045 4.8A Dual USB Charger Socket is that the output is more that double that of the old 1016 model. 4.8a with the 1045 versus 2.1a with the 1016 model. One thing that I really hated about the older Blue Sea 1016 2.1A Dual USB Charger Sockets was the fact that they included a small LED that stayed lit all of the time. The light was annoying when trying to sleep so I placed a small piece of black electrical tape over the LED in order to “black it out”. The other downside to the LED constantly glowing was the parasitic draw it had on the battery system. Each of the older 1016 sockets with the LED has a 15mA parasitic draw. Ouch. The new 1045 sockets have NO LEDS! Yay! This drops their parasitic draw way down to 1mA. Way better. The Intelligent Device Recognition technology built into the new Blue Sea 1045 4.8A Dual USB Charger Sockets is supposed to determine what the optimal maximum charge amperage is for each device you plug into the socket. Whether it be an iPad or a cell phone it’ll determine which is the best charge amperage to send to the device which is up to 2.4a per USB slot in the socket. 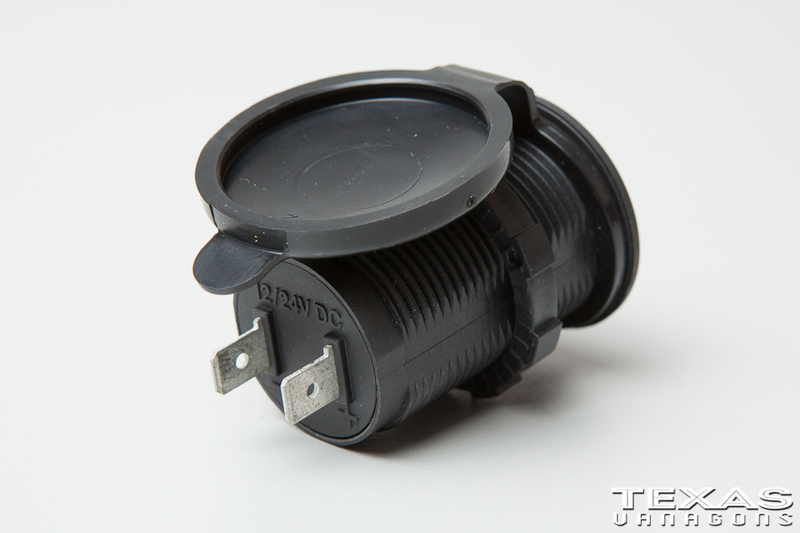 The mounting holes are called out at a 1-1/8″ diameter hole. I currently use a CMT 537.285.31 Forstner Bit, 1-1/8-Inch Diameter, 3/8-Inch Shank which works great! These Forstner Bits make cutting through various thicknesses of wood an easy task. They’re relatively inexpensive as well clocking in at about $11 each. If you already have the older 1016’s installed, they share the same hole diameter so you just need to unplug, remove the 1016 and install and plug up the newer 1045. They’re interchangeable. Looks like it’s time I swap out my older 1016 Sockets with the new and improved 1045 Sockets! Nice. The 1A ones just don’t cut it any more. Ha, I wrote a similar post about a similar product. http://osoverland.com/blue-sea-systems-dc-voltmeter/ Through one of these in there while you’ve got it apart. With Able, it’s Lead follow or get out of the way. I like Able have a bunch of the older ones in different locations. I will be changing them out and handing the old one out as party gifts. Nice find Able. Will these fit the hole in the Vanagon dash where the lighter is located? With slight modification. It needs to be enlarged. I bought a large step drill bit from Harbor Freight and it worked great. Can you write up how to wire these to battery? Please. 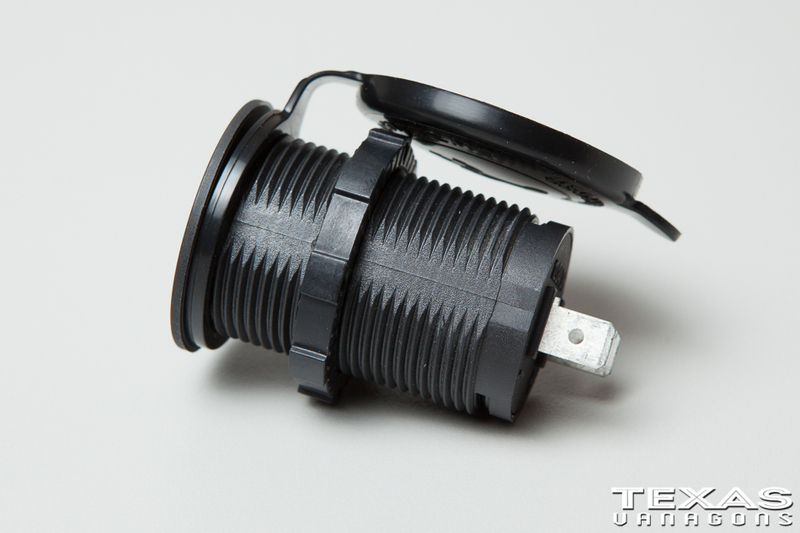 I have a Blue Sea fuse block so I run + and – wires to that box with a 10amp fuse on the +. If you’re running straight to the battery you can run the + to the battery + post but make sure you add an inline fuse to this wire. 10amp fuse as mentioned above. The – from the USB charger can be grounded to the chasis. depending on where you install yours you may or may not have a ground screw you can piggy back on. I prefer running both th + and – back to the Blue Sea fuse block that way everything is there and easy to troubleshoot later. Remember. Remove the – battery cable from the battery before doing any electrical work, Just to be safe.